It's that time of year again, when I become increasingly frustrated at the exploitation of wild animals to create "festive cheer" for us peoples. Every year, up and down this country and across Europe and America, reindeer are paraded in front of excited families to add that "extra Christmassy element" to events such as Christmas Light Switch On's, fetes and Santa's grotto appearances. I get it, it seems harmless, and for the most part the reindeer just stand there, eating, seemingly entirely unbothered by what's going on. Occasionally they're lead around by loving and affectionate handlers who seem reassuring and confident in caring for the deer. Basically, the deer look happy enough. 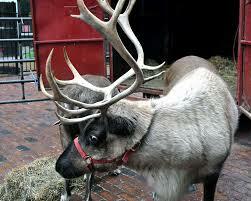 I'm not suggesting for a minute that reindeer used for these events are being actively, physically abused. If they were, there'd not only be visible signs of their mistreatment (malnourishment, injuries etc.) but they'd also behave in a way that wouldn't be particularly conducive with delighting children. My objection is a really, really, basic one. Reindeer aren't from England. In fact, there is only one place in the entire country suitable for reindeer (whilst they don't occur there as a native species) and that is the Cairngorms. In central London, or Margate, or Liverpool, or Glasgow, or the Welsh valleys - reindeer find themselves in a very unsuitable environment. They may be used to electric lighting, loud noises, excitable children and Slade lyrics; but they shouldn't be - we did that to them. We exposed them to situations so alien, that they couldn't care less. That's not right. The reindeer that appear at your local Christmas themed event are robbed of a natural reindeer life, they probably haven't ever experienced a natural reindeer life. The life that they do experience might be one in which they're provided with someone warm to eat and regular food, but we provide that same basic level of compassion to our rapists and murderers. If you agree that forcing elephants to perform tricks at the circus is outdated and cruel, are you comfortable with reindeer being dressed in sleigh bells and forced to stand, often for hours at a time, in a small pen whilst the public gawp at them and thrust smartphones in their faces. 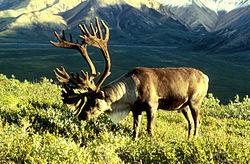 Reindeer don't appear at a single, isolated event either. Ordinarily they'll begin appearances in November, and work through to Christmas Eve, often at opposite ends of the country, travelling from one site to the next in a lorry. The transportation of reindeer in a lorry benefits people, people who get to see them and feel "Christmassy" and people who benefit financially from "hiring them out". The reindeer get nothing, literally nothing, from this other than perhaps survival. They're fed, watered, sheltered - their diet rarely represents what wild reindeer would eat because we don't have access to the same vegetation for a start. This year, please, don't support events that believe that the breeding of wild animals to be used purely for entertainment, and not allowing them a natural, reindeery life, is OK. It's not OK, we're better than that, and I at least want to raise my children to know that reindeer don't live in car parks.